If you don't have a clue how to upgrade your Zodiac Agathion, this tutorial will surely explain how it should be done. To start with the upgrading process you'll need to get one of the Zodiac Agathion Packs ( High, Mid or Low) that can be obtained while playing the Fortune Reading Game. Check also our Lineage 2 Adena offer. Before the Salvation update, there were Permanent Zodiac Agathions Bracelets. They can be exchanged now for the non-evolved ones. 2. Depending on your Agathion name you can exchange it to a certain level of the new non-evolved one. 1. 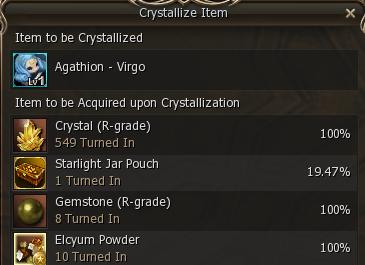 First of all you will need Stage 1–11 Zodiac Agathion Bracelet and a Starlight Jar that can be obtained by crystallizing Stage 1–12 Agathion Bracelets (higher the stage = higher the success rate). 2. To upgrade the non-evolved Zodiac Agathion you will need to use the Compound option that is accessible from your inventory. There is a 100% chance that you will upgrade Agathion on each stage starting from 1 to 12. 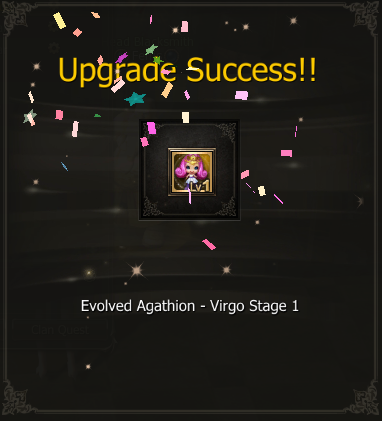 After you will receive a Stage 12 Zodiac Agathion it can be evolved further. 1. 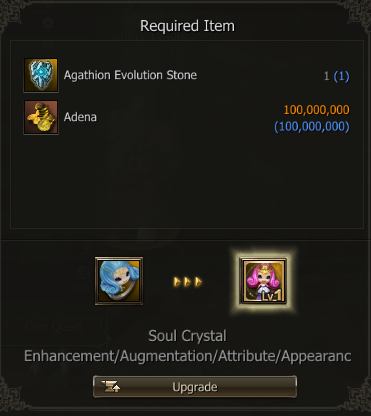 You gonna need a Stage 12 Non-evolved Agathion Bracelet, an Agathion Evolution Stone (it can be obtained from Fortune Reading game or bought with Adena from other players) and 100kk Adena. No matter if you play on NAIA, FREYA or CHRONOS the items needed for upgrade are the same. 2. 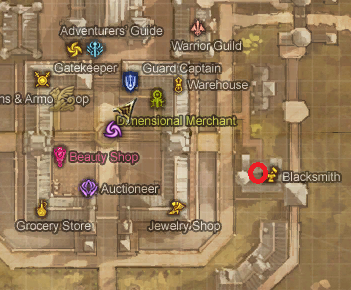 Visit Head Blacksmith Ferris in the Town of Aden. 3. 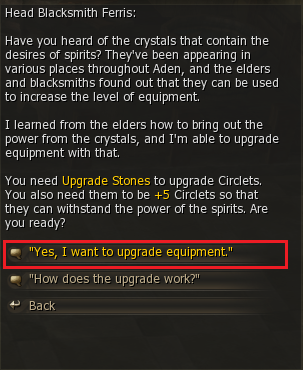 Option: "I want to upgrade equipment." 4. 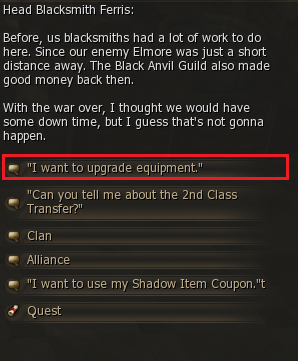 Next: "Yes, I want to upgrade equipment." 1. The same method like with the non-evolved ones. You will need a Stage 1–4 Evolved Zodiac Agathion Bracelet and a Red Star Bottle. 2. Use compound option from our inventory and the Evolved Agathion and Red Star Bottle and press START. 3. If the compounding will be successful the Agathion stage will be increased by 1. 4. If not... you will end up with the Zodiac Agathion on the same stage as it was, but the Red Star Bottle will be consumed.